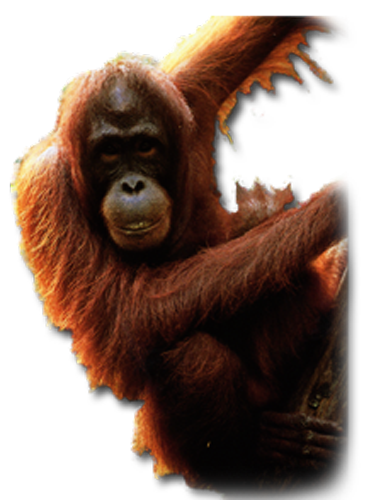 Pongo is represented by two species: Pongo pygmaeus, the Bornean orangutan, and Pongo abelii, the Sumatran orangutan. 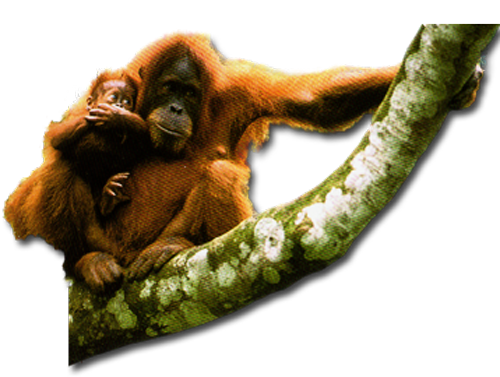 The orangutan, or “the orange man of the jungle,” is the largest arboreal mammal in the world. Native to the Indonesian islands of Borneo and Sumatra, these solitary great apes are widely considered to be of the most intelligent and strongest members of the animal kingdom. Orangutans are extremely sexually dimorphic. Males are 2 – 3 times larger than females. In addition, sexually mature males develop extremely long and thick hair (which adds to their impressive size), massive throat sacs and cheek flanges, and blonde beards. Life expectancy both in the wild and in captivity is approximately 45 years. Until recently the Miami Metro Zoo housed the oldest captive orangutan in the world. At age 56, Nonja succumbed to natural causes. 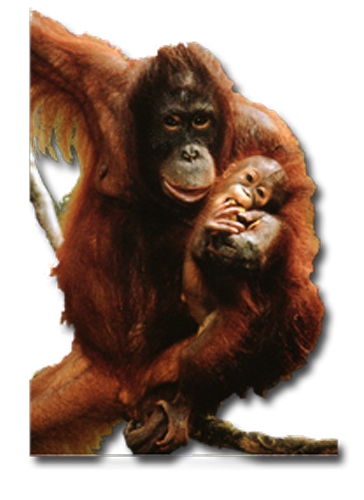 Orangutans reach sexual maturity between the ages of 11 – 15 for females and around age 15 for males. Females will rear their offspring for approximately 8 years and they exhibit the longest birth interval of any primate at 11 – 13 years. Orangutan males have evolved a unique strategy for obtaining sexual access to females. There appear to be 2 distinct morphotypes of sexually mature males. The first is represented by the territorially dominant male. The second is that of a subadult which is adopted by transient males. According to Stanford, et al., “These transients are fully reproductive but lack the secondary sexual characteristics associated with the territorial male. They are physically smaller as are their throat sacs, canines, and cheek flanges.” These males attempt to forcefully copulate with females under the guise of an adolescent male. Their testosterone levels are lower than territorial males and the cause of this hormonal condition is unknown, but it is suspected that after these transients acquire territory and females of their own that their secondary sexual characteristics will begin to flourish (Strier). 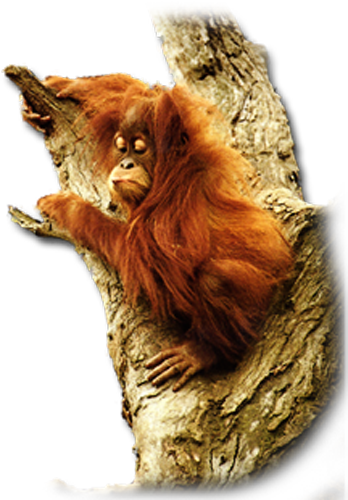 Orangutan anatomy is highly adapted for arboreal life. Their wingspan can reach up to 7 feet, they have huge hands and fingers, and their feet are very prehensile. The shoulder girdle, wrist, and hips all provide the greatest range of motion seen in the great apes (Burnie and Wilson). Orangutans locomote via quadrumany. This technique involves using all four limbs together in slow deliberate grasp and release movements and is typically associated with climbing. Orangutans seldom venture to the ground. When terrestrial locomotion is required they employ a modified version of terrestrial quadrupedalism. Whereas gorillas and chimpanzees are considered knuckle walkers, orangutans are hand or wrist walkers. Their weight is positioned on either the palm of the hand or the base of the wrist. 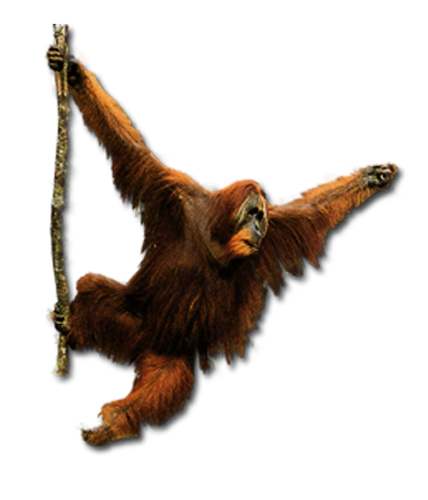 Terrestrial movements are, again, slow and deliberate but when needed the orangutans possess tremendous quickness and agility. 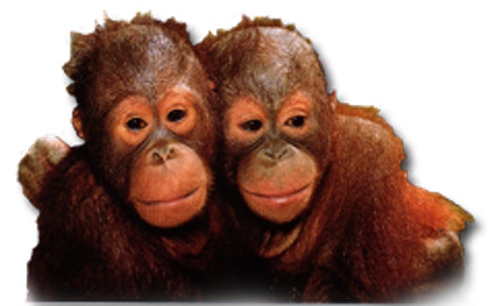 Primates communicate with both the face and eyes to a great extent and orangutans rarely engage in face – face viewing (Kaplan and Rogers). 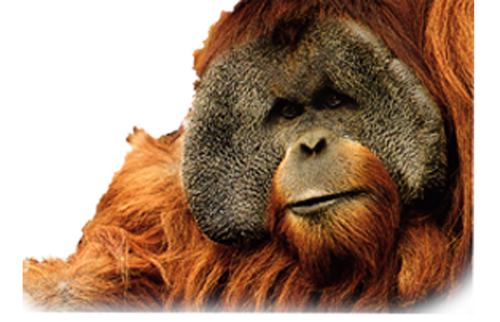 Orangutans are quite puzzling with respect to their social structure and group formations. It is widely considered that animals with increased intelligence develop and live within highly structured social groups. Nearly every primate species, including humans, lives within these social groupings. Orangutans, however, are extremely solitary. A single sexually mature male will roam and attempt to control as large a territory as possible. As stated previously, “Mothers and dependant offspring can be seen together as can sisters. Only when food is in abundance will orangutans be seen in multiple numbers feeding in the same area.” He will defend his food surplus and all available females located within his territory from any male who approaches. The defense strategy is simple. According to Strier, “Possibly the greatest asset males provide to females is protection from other males. The territorial male will use his amazingly loud baritone long call provided by his huge throat sac, massive bulk, and large canines to discourage other males. If this does not work, violent combat will erupt. It is suspected that females reinforce this protective behavior by screaming loudly and fighting with the intruder.” This intense male – male competition can be expected with such drastic displays of sexual dimorphism, especially in body size. The environmental impact on activity levels and play profiles of captive orangutans propose that there exists a strong correlation between the two and: age of the individual(s), enclosure size, complexity, and volume, number of social partners, number of maneuverable items, and provision of foods. According to Perkins, “Orangutans under the age of 10 had the highest overall activity levels and adult males had the lowest. There are four factors that strongly predict the activity levels of captive orangutans: (1) number of animals in the community [highest]; (2) usable surface area [higher]; (3) number of controllable objects [higher]; and (4) enclosure volume.” Tripp’s analysis of orangutan activity levels indicate that wild orangutans invest over 50% of their time in the manipulation of vegetation, branches, and food and that captive orangutans had their highest activity levels when manipulable objects and edibles were introduced together. 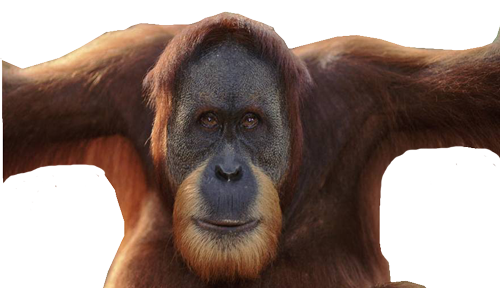 The Sumatran Orangutan tends to be slightly smaller in size (most noticeably in the cheek flanges and throat sack) than the Bornean Orangutan, with generally lighter colored hair and a longer beard than it’s cousin.